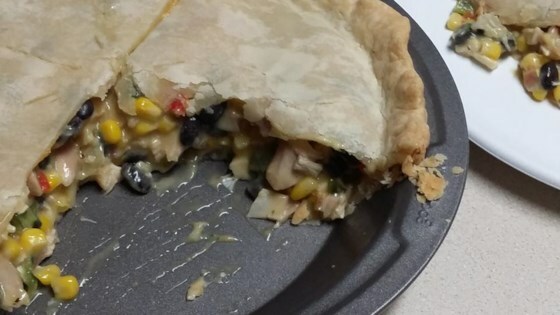 "This pie is super fast and easy to make with leftover turkey." Preheat oven to 350 degrees F (175 degrees C). Line an 8-inch pie dish with 1 pastry crust; set the other crust aside. In a bowl, mix together the turkey, cream of chicken soup, seasoned salt and pepper, Cheddar cheese, and mixed vegetables. Pour the mixture into the prepared pie dish. Top the pie with the remaining pie crust, then pinch and fold the edges of the crusts together to seal. Cut a slit into the top of the pie crust with a sharp knife to vent the steam. Bake in the preheated oven until the crust is golden brown and the filling is bubbling, about 40 minutes. After 40mins @350 the pie crust is not even close to being done. Not sure what the problem is but this isn't working/cooking well. The only thing I did differently was to use the Kraft cheddar cheese crumbles rather than shredded cheese. This is so good and easy to make! Also good with chicken in place of the turkey. This recipe was wonderful and easy to put together. We will definitly be having this one again.